The Sebo Twin Motor Upright's ability to clean when flat and the low profile 'L' shape cleaning head enable the vacuum cleaner to reach under furniture and clean right up to skirting boards. The Sebo Twin Motor Upright has the ability to clean when flat and the low profile 'L' shape cleaning head enable the vacuum cleaner to reach under furniture and clean right up to skirting boards. 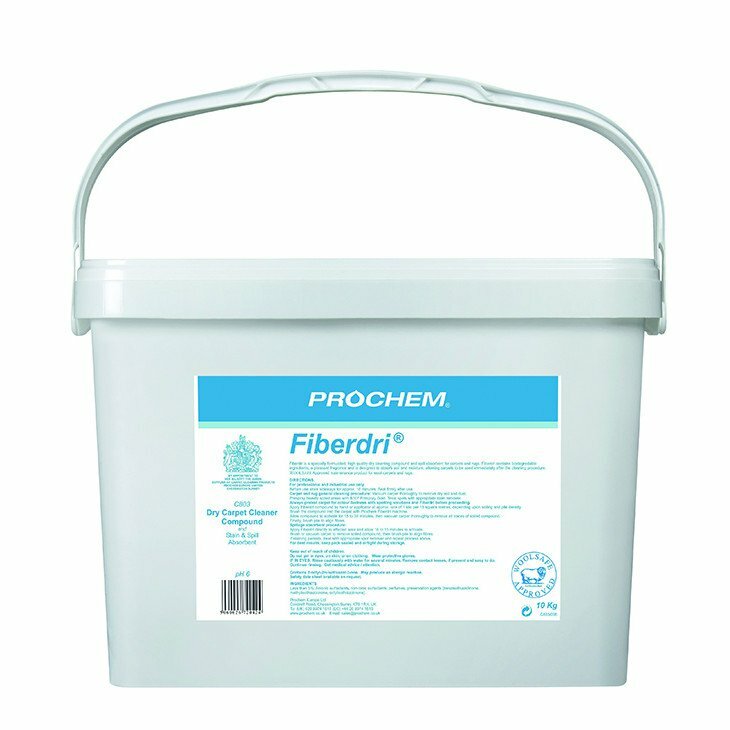 Fiberdri® is a specially formulated, high quality dry cleaning compound and spill absorbent for carpets and rugs. Fiberdri® contains biodegradable ingredients, a pleasant fragrance and is designed to absorb soil and moisture, allowing carpets to be used immediately after the cleaning procedure. WOOLSAFE Approved maintenance product for wool carpets and rugs. For professional and industrial use only. Before use store sideways for approximately 10 minutes. Seal firmly after use. For best results, keep pack sealed and airtight during storage. WoolSafe approved for wool carpets and rugs. Ready to use in conjunction with PB14E, 380 DCS or Fiberdri® TM4 carpet dry cleaning system. Approx. coverage 15m2 per kilo. Carpet and rug general cleaning procedure: Vacuum carpet thoroughly to remove dry soil and dust. Prespray heavily soiled areas with B107 Prespray Gold. Treat spots with appropriate stain remover. Always pretest carpet for colour fastness with spotting solutions and Fiberdri® before proceeding. Apply Fiberdri® compound by hand or applicator at approx. rate of 1 kilo per 15 square metres, depending upon soiling and pile density. Brush the compound into the carpet with Prochem Fiberdri® machine. Allow compound to activate for 15 to 30 minutes, then vacuum carpet thoroughly to remove all traces of soiled compound. Finally, brush pile to align fibres. Spillage absorbent procedure: Apply Fiberdri® directly to affected area and allow 10 to 15 minutes to activate. Brush or vacuum carpet to remove soiled compound, then brush pile to align fibres. If staining persists, treat with appropriate spot remover and repeat process above.